Sheriff Mike Chapman leads a candlelight vigil in August to remember those who died from drug overdoses. His agency has investigated 17 fatal overdoses so far in 2016. 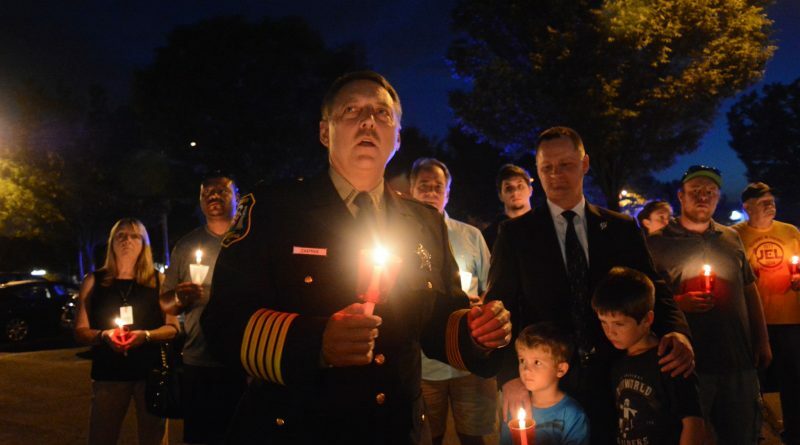 [Loudoun Now/File Photo Sheriff Mike Chapman leads a candlelight vigil to remember those who died from drug overdoses. The nation’s opiate epidemic hit Loudoun years ago, but in 2016 the county’s law enforcement and political leaders shined a brighter spotlight on the issue. And lives were saved. As the number of heroin overdoses soared in 2014, Sheriff Mike Chapman was among the county leaders calling for more attention to the dangers of opiates. This year, he provided deputies with a new mission—not necessarily to put these drug abusers behind bars, but to keep them alive. Working with a regional task force, he began training deputies to administer naloxone, medication that can quickly counteract the symptoms of opiate overdoses. That initiative launched last December as a pilot program. In February, two deputies were credited with administering the first treatment to revive an unresponsive overdose victim. By May, the program had been expanded to include 160 trained deputies. Through Dec. 21, the Sheriff’s Office reported that deputies successfully administered naloxone on 10 occasions. Overall, the agency responded to 81 overdose calls—56 for heroin and 25 for other opiates. Sixteen heroin overdoses were fatal and one other opiate case was fatal. Behind those front lines, local, state and national political leaders also focused on the issue. In February, a U.S. Senate committee came to Loudoun to hear testimony on the epidemic abuse of opiate medication. 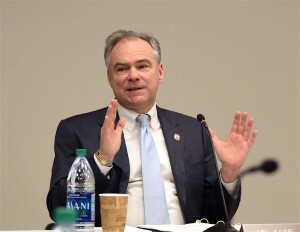 Organized by Sen. Tim Kaine (D-VA), the hearing was part of a broader effort to address the rapid increase in the number of fatal overdoes resulting from opiate and heroin abuse. The session focused on potent and highly addictive painkillers, ranging from Vicodin to OxyContin, that originally were designed for short-term relief and palliative care for cancer patients, but have come to be prescribed—and overprescribed—as part of routine care. Four out of every five heroin overdoses are linked to prior opioid use; and increasingly opiate overdoses are becoming a concern for older Americans, with the 55-64 age group now the fastest growing segment for prescription medication overdoses, the committee was told. In the fall, Herring announced a program aimed at stepping up prosecution of dealers in heroin fatalities by using federal statutes and providing assistance to local commonwealth’s attorneys offices dealing with complex cases. At year’s end, Gov. Terry McAuliffe’s administration declared opioid addiction a public health emergency in Virginia, with hospitals reporting fatal overdoses at a rate of three per day. The number of emergency visits for heroin increased 89 percent during the first nine months of 2016 compared with 2015. There were 4,036 Virginia deaths from prescription opioid overdoses from 2007-2015, according to the Virginia Hospital and Healthcare Association. The governor’s budget proposal includes $31.7 million in new funding to improve mental health and substance abuse disorder treatments in state facilities, community services boards, and in local and regional jails. Locally, county leaders and activists worked to provide support for addicts and their families. In August, more than 100 people gathered in Leesburg for the Vigil for Lost Promise, reflecting on the men and women whose lives were cut short by drug addiction. Participants said it was important to remove the social stigma associated with drug addiction and to provide more treatment and support resources. “There’s no demographics associated with it. White, black, Hispanic, Asian—it has no boundaries. It doesn’t matter how rich you are, how poor you are. No one is exempt,” Karl Colder, special agent in charge of DEA Washington Field Division, told the crowd. The coalition of law enforcement and political leaders also held a series of community forums on the issue, offering screenings of the documentary “Chasing the Dragon: The Life of an Opiate Addict” and panel discussions from experts. At a forum in December, Del. John Bell for the first time shared his family’s struggles with his son’s opiate addition and pledged to do more to combat the crisis. “My point of view on the issue has changed; as a father, citizen, and legislator. I have seen first-hand how our criminal justice, mental health, and crisis intervention systems may not be meeting the challenge of this crisis,” he wrote in a letter to the editor. Bell adds his name to a list of legislators—including U.S. Rep. Barbara Comstock (R-VA-10), Sen. Jennifer Wexton (D-33) and Del. Randy Minchew (R-10)—who have identified the issue as a legislative priority. Among the legislation expected to be reviewed during the upcoming session are bills to remove barriers to the prosecution of suppliers in fatal overdose cases and to improve the state’s prescription drug database to combat efforts by addicts and dealers to obtain opiates from multiple doctors. 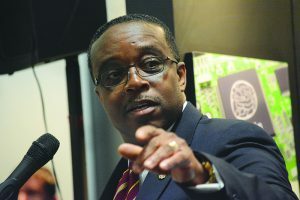 Closer to home, the Board of Supervisors plans budget discussions on whether more local resources should be provided to help addicts and whether to reinstate the Drug Court, which provided extensive supervision of drug users facing jail time.